With the stock market going willy nilly as it has lately, I have become a big believer in being economically sensible but I also believe in doing things properly. I believe in manners and thank you notes in the mail. I keep a calendar in my bag. There is something gratifying about checking off an errand on your list that you just don't get with your laptop's calendar function. For parties I always thought it was lovely (and proper) to send a paper invitation. We once threw a holiday party and sent everyone invitations with a small fresh pine branch attached. I still believe in sending cards through the mail, however once I discovered Paperless Post it is all we use now for events and parties. It's the smartest thing. It's brilliant, actually. Paperless Post was created in 2008 by a brother and sister as an alternative to ad supported online invitation sites while keeping the feel and integrity of traditional paper and ink communication. 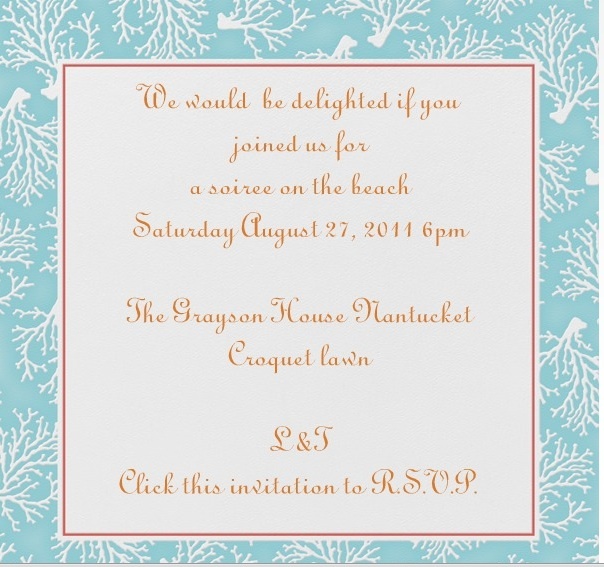 You can customize your invitation with hundreds of designs, inks and even liner envelopes. When you sign up (for free!) you receive 25 free stamps (1 stamp = 1 email invitation). To purchase 30 more stamps is $5.00. (1000 stamps is $50 or $440 if you were to actually mail them.) Liner envelopes can be purchased as well. I'm over the moon for the liner papers. 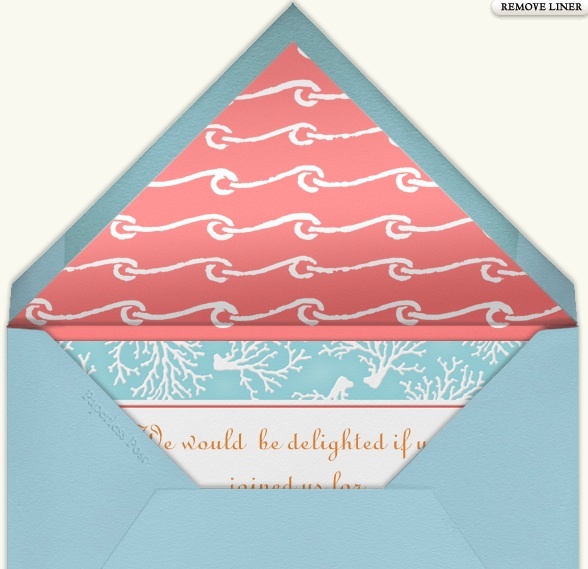 The coral oceany liner is dreamy with a robin's egg blue envelope. There is something thrilling about going to get your mail, sorting through it and then among the bills and the magazines and ads, finding a card that is for you. Just for you. Wishing you a "Happy birthday," "Just because I love you" or "Please, oh please won't you come to my party?" With Paperless Post you still keep some of that feeling because of the delivery system of the card. The recipient doesn't receive a link like some other online invitation companies. Rather, your recipient will open an email with an envelope that has the true texture and color of a real envelope. When he clicks on it the envelope will open and the invitation slides out revealing your invitation. It has the same feel as receiving the invitation in the mail but it's greener and it's more immediate. The recipient can then click on the invitation to respond. Why should you use Paperless Post? Find out more about what they're doing over at Paperless Post on their blog. Create your own invitation here. Here's to many happy parties!